Saint Lucia has taken another step forward in its fight against human trafficking by launching a public awareness campaign that includes a hotline number, 847. The campaign also comes with the slogan, “See it. Know it. Report it”, which is a call to Saint Lucians to educate themselves about the crime of human trafficking, have the capacity to identify it and the will to do something about it if recognized, such as reporting suspected incidents to the authorities. The hotline is an avenue for the public to report suspected cases and lies with the Police Control Room and is a 24-hour service. The campaign, which was launched at the studios of the Government Information Service last week, is part of a three-prong effort provided by the International Organization for Migration (IOM) to the Government of Saint Lucia through the Department of Home Affairs and National Security and has been ongoing from January of last year. The other components of the campaign include capacity building for front-line stakeholders to be equipped to properly identify, protect and refer victims of human trafficking and the development of a database to strengthen the collection and storage of data on human trafficking in Saint Lucia. 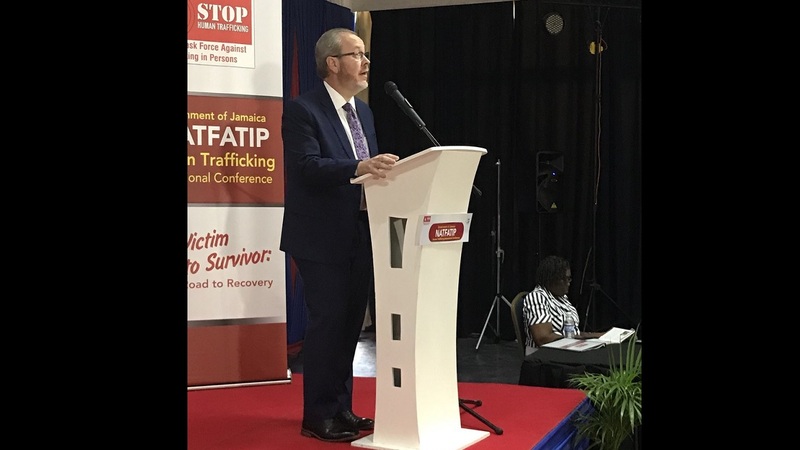 Home Affairs and National Security Minister Hermangild Francis, at the opening, said that trafficking in person is an ugly truth, a dehumanizing crime that involves atrocious acts carried out against men, women and children. “I believe those days of denying or thinking we are immune to this crime (human trafficking) occurring here are long over. I want everyone to sit up and pay attention to this campaign,” Francis said. The Minister was proud of the fact that Saint Lucia, after three years as a member of IOM, had been able to develop a Standards Operating Procedure to guide stakeholders with a role in the identification, protection and referral of any potential and/or confirmed victim of trafficking. Saint Lucia currently stands at Tier 2 in the international rankings pertaining to human trafficking, a position Francis claims the country is proud of. “The next step is Tier 1 but it is difficult to get there overnight. There are some demands that have wider implications. We would be very happy to work towards Tier 1 as long as the Department receives the necessary backing,” Francis said. According to the Minister his government has been able to strengthen the country’s capacity to effectively combat trafficking in persons, the instructional capacity of government departments and the judicial sector and now the entire population with this campaign which was carefully designed to promote awareness.